Instructions on how to return items to Mobile Fun can be found on our returns page here. Once we have received and processed your return, we will send you a confirmation email to keep you updated. There are a number of ways to track your order. You'll receive an email confirmation from us when you place your order. Simply visit the My Account page located at the top of the Mobile Fun home page. From here you can review your orders and track the status of any outstanding orders. You can quickly track the status of your order on the "Track My Order" page. All you'll need is your email address and your order number provided in the order confirmation email that you will have received. If you have selected a tracked delivery method you will find the tracking number in the dispatch email and in "My Account". Please note that not all delivery methods offer a tracking facility. You can enter the tracking number on the courier's website (e.g. DPD, DHL). This will inform you of any delivery updates provided by the courier that you selected at checkout. We offer one flat delivery price for your order, no matter how many items you buy. For partially in-stock orders you pay for delivery only once. We’ll ship what’s in stock now and the rest later at no extra charge. Royal Mail 48, aims to deliver within 2-3 working days including Saturdays. Order by 6pm for same working day dispatch. This service guarantees next working day delivery (Monday-Friday) and provides a comprehensive tracking system, including a live driver tracker and a 1 hour delivery window. Order by 6pm for same working day dispatch. You can find out more information about our delivery options and international deliveries on our Delivery Information page. What do I do if my order has been dispatched but hasn't arrived yet? We're sorry to hear that your item has not arrived yet. Please check that you have received a dispatch email from us to ensure it's on the way to you. Royal Mail Economy - Most orders normally arrive within 2 to 3 working days (Monday - Saturday), although on rare occasions orders can take longer. If it has been more than 10 working days then please contact us and our dedicated customer services team will endeavour to solve your issue. You can find details on how to contact us at the bottom of this FAQ. DPD Next Working Day - Please note we only dispatch on working days (Monday-Friday) and expect items to arrive by the next working day. For example, an order placed on a Saturday would be scheduled to arrive on a Tuesday. Delivery will take two days from dispatch for the Northern Highlands, Northern Ireland and other distant areas. You can track your order here. Please contact us below if your item hasn't arrived when promised. DHL Global Mail - Please allow up to 20 working days for your items to arrive, due to the nature of international shipping from the UK. If the order hasn't arrived within 20 working days (so typically 5 weeks) please contact us below. DHL Global Express - Deliveries typically take 3 to 5 working days, but may take longer. You can track your order here. Please contact us below if your item has not arrived within 20 working days. Do I have to pay duty on my delivery outside of the UK? All orders sent outside of the UK and EU are shipped on a DDU (Delivery Duty Unpaid) basis and may be subject to local customs import duty, which is charged on the value of the purchase. Payment of these fees is the sole responsibility of the customer. For example, customs duty must be paid on all orders over $200 when shipped to the United States. Payment of the duty charge is necessary for the release of your order from customs on arrival to your country of delivery. If you refuse to pay the import duty levied against your shipment, this may result in the shipment being returned to Mobile Fun. In this case, all related returns charges plus a minimum administration charge of £5.00 (or equivalent currency at current exchange rate) will be charged against your final refund amount. How do I request an electronic copy of my invoice? We provide a paper copy of your invoice with your order. However, if you require an electronic copy, please contact our support team and we will email one to you. How do I make a change or cancel my order? Please track your order to check that it hasn't already been dispatched. If your order has already been dispatched then we are unable to make changes to it and any unwanted items will need to be returned. If your order has not yet been dispatched, simply contact our support team, ensuring that you include your order ID and the desired changes. We're sorry to hear that. Can you please check your invoice as it may be that part of your order was out of stock. We don't group our items in one delivery so that you receive your order as quickly as possible. You can pay by PayPal or credit/debit card via our website. Unfortunately, we cannot take payment via American Express. Mobile Fun takes your security seriously. As part of this commitment, we partner with your bank to protect you from fraud. We use Verfied by Visa and Mastercard Securecode to prevent fraud taking place on your account. How do I know if an item will work with my device? 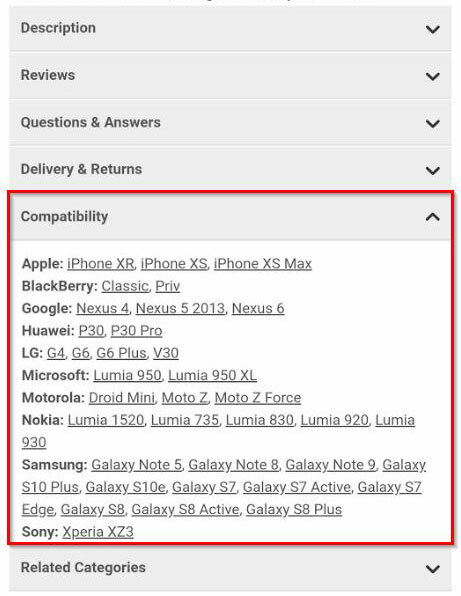 If you visit the item's page, you can select the "compatibility" tab which will give a list of all of the devices that an item will work with. We do our best to update the stock messages on our websites as soon as we have an estimated arrival date of the items. To reserve an item, you can purchase it through our website, and the item will be dispatched to you as a priority as soon as the stock arrives at our warehouse. You can also register for "back in stock" alerts underneath the "add to basket" button on our product pages. This will send an email to you directly when an items arrives. Do you have instructions or a user manual for my item? We normally provide instructions on how to use an item in the packaging. If there is nothing included, then please check the website item page, as there may be an electronic copy stored there. To reset your password, visit the "Forgotten Your Password" page. Haven't found the answer that you were looking for in our FAQ? Feel free to contact us! We work through our emails 7 days a week and aim to respond to customers within 48 hours. How do I contact the Business to Business team? Contact our dedicated B2B team to find out about our trade prices and exclusive business account offers! Contact the B2B team here.